Ant-Man, as obscure a superhero title as has been released since the inception of the so-called "MCU" (Marvel Cinematic Universe), may test the perception that Marvel can do no wrong. The general public knows Spider-Man, Iron Man, Captain America, and The Hulk, but they don't know Ant-Man. And, unlike what happened with Guardians of the Galaxy, Marvel hasn't carpet-bombed pop culture with a marketing blitz. So Ant-Man has to stand on its own merits with only the Marvel brand to differentiate it from, for example, Green Lantern. The movie tries to offer something marginally different from the run-of-the-mill superhero origin story. It's hard to say how much of Edgar Wright's original vision remains in the final product, but the tone is more jokey than that of most Marvel movies. Unfortunately, it's almost impossible to make it through the entirety of Ant-Man's two hours without thinking of Honey, I Shrunk the Kids as least once, and I'm not sure that's an association the filmmakers were courting. Narratively, tone differences aside, this follows the "origin story" formula with little variation. With the exception of an unfortunate deus ex machine plot point, every beat of Ant-Man is predictable. The movie is engaging in the same way as a generic romantic comedy: we know exactly what's going to happen at every moment but there's some comfort in that. 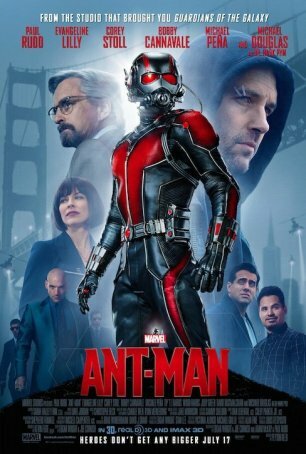 Ant-Man contains some compelling scenes (there's a great fight sequence between the title character and someone more established from the MCU) but there's nothing innovative in terms of content or how it is presented. Ant-Man scampers along with a "been there, done that" vibe. The attempts at overt comedy are hit-and-miss. The heist elements are derivative and not nearly as inventive as one might expect given the possibilities. The action sequences are variable and the dramatic moments… the less said, the better. Despite having buffed up physically for the part, Paul Rudd is an unlikely choice to play a superhero. His character, Scott Lang, is intended to be an "ordinary guy", and the actor imbues Scott with the most ordinary of traits: he's kind-of boring. The defining factor in Scott's life is that he wants to be a good dad. After spending some time in prison (he once earned his living as a Robin Hood-inspired cat burglar), Scott has a lot to make up for. The problem with this backstory is that the screenplay never sufficiently cultivates the relationship between Scott and his daughter for us to really care. As played by Abby Ryder Fortson, Cassie is a one-note "cute" movie child that the filmmakers fail to develop. Her scenes with Rudd don't gel. This is a critical rent in the film's dramatic fabric. The movie opens with a scene in which an impressively de-aged Michael Douglas, playing Dr. Hank Pym, takes a moral stand against the military-industrial complex. Led by Howard Stark (John Slattery), a group wants to weaponize Pym's breakthrough technology, which can shrink objects. Jumping ahead a few decades, we learn that Pym is now on the outside of his company looking in. His former protégé, Darren Cross (Corey Stoll), is running the show, aided by Pym's estranged daughter, Hope (Evangeline Lilly). When he realizes they have nearly succeeded in duplicating his research, he decides it's time for someone to wear the incredible shrinking suit he once used. He chooses ex-con Scott and goes about recruiting him. His chief selling point: by becoming Ant-Man, Scott can redeem himself in his daughter's eyes. Ant-Man feels overlong, with a lion's share of the screen time devoted to the obligatory scenes of Scott learning his "craft." We get the expected training montage; I suppose no superhero origin story would be complete without this. There's a quasi-romance between Scott and Hope that comes out of nowhere and goes nowhere. Ant-Man is hyper-aware of its place in the MCU. It name-drops shamelessly and features several appearances by characters we have seen before. The overall effect is to remind us that there was a time when the MCU was less crowded and more fun. Stand-alone superhero movies have no place in this universe anymore. Numerous previous productions have used special effects to create the illusion of a man reduced to insect size and forced to navigate the micro world. Ant-Man, in part because it mixes practical and computer-generated visuals, does perhaps the best job of this to-date. The movie doesn't dwell on the perils of being no larger than a thimble but that's not its goal. Some of the quixotic imagery late in the proceedings is less successful. The 3-D, as is often the case, is unnecessary and sometimes distracting. It's obvious that only a select few directors understand how to employ 3-D to enhance a production; based on the evidence at hand, Reed (Yes Man) isn't among their number. Ant-Man isn't "bad" in the sense that many movies are "bad." It's just lackluster - a diversion with no staying power. The lead character is interchangeable with any number of Grade B superheroes - his unique "power" doesn't make the results or the means to achieve them sufficiently different. It wasn't that long ago when superhero movies took chances. (Remember The Dark Knight?) Now, they are risk-averse. That's perhaps the most disappointing thing about Ant-Man. For comic book fans, the addition of Ant-Man to the Marvel family will undoubtedly be greeted with high-fives and cheers. The movie, however, doesn't give the rest of us a reason to care. As the post-credits caption informs us, Ant-Man will return, although it's likely he'll be back as part of a team. This is an appetizer and like most meager fare, it doesn't satisfy. Let's hope the main course, when it comes, offers more than these warmed-over hors d'oeuvres.